Hey all. Some of you may have been following my progress on this for a while now. If so, then rejoice, for AngelLoader is ready for beta! And if not, then... go about your day I guess! 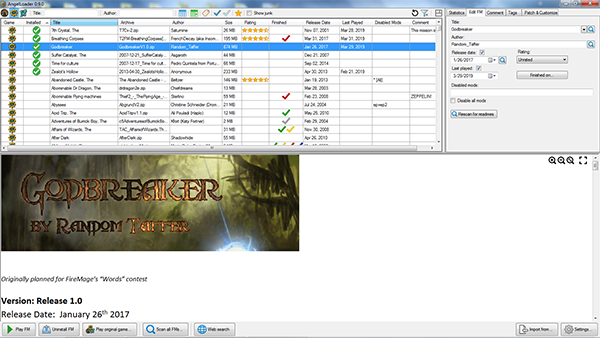 AngelLoader's main claim to fame is that it's a standalone loader, where you can see, play, and manage your entire FM collection from one place (like DarkLoader), with full NewDark support (unlike DarkLoader). It's also got a fast and accurate scanner, so you'll rarely have to enter titles or authors by hand - and it detects NewDark Thief1/Thief2 accurately (also unlike DarkLoader). But enough self-aggrandizing - it's time to get this thing tested. If you'd like to test, you'll need to be registered at http://shalebridgecradle.co.uk. I'll add you to the group. Thank you and let's get this thing ready to rock! Hey Fen, glad it's ready for testing! I have Win10 1809 and Linux Mint 19.1 (dual-boot), own all 3 games that work on both OSs, have been using NDL in Windows and FMSel in Linux (since NDL doesn't work) but not DL in a long time, am not that big on metadata but like to record loot, secrets & sometimes short comments and a rating. I believe I'm still registered at Shalebridge. Awesome, thanks! I've added you to the group, so you should be able to access the forum. I've never done this before so let me know if you can't access it or anything. I logged in to the testing forum with no problem, will try it out soon.